This Maasai Mara National Reserve safari includes 2 nights camping or in a safari lodge with game drives in the Maasai Mara National Reserve. Maasai Mara is probably the most famous of the reserves & is located in Kenya’s south western corner and boasts an astonishing amount of game. The national reserve is unfenced, with the Mara being bounded in the east by the Ngama Hills and in the west by the Oloololo or Siria Escarpment. Gazelle, wildebeest and zebra graze in large numbers and attract many & varied predators. Not only is this a great place in which to find game, but also the wide green-gold savannahs spotted with thorn trees make it ideal for photography. A Maasai Mara safari offers both spectacular scenery & unforgettable game viewing and with a large selection of private lodges is a popular option for a Kenya tour. All our tents offer a fantastic view of the river and the park. You can watch the animals drinking at the river while enjoying your meal on our restaurant terrace. Likewise you will be able to explore a true bird paradise. In the evening you will experience romance at the camp fire and enjoy the endless expanse of the Masai Mara with breathtaking sunsets. In our restaurant the fresh products from Kenya are processed to culinary treats. Bread and pasta are freshly baked daily, and our noodles are homemade. We also serve a good glass of wine, a cold beer or a delicious long drink in the bar, at the fire pit or in the beer garden. We kindly ask our guests without full-board to make a reservation for all meals in the restaurant – which is not necessary for the drinks in the bar, of course. Cheers! And because it is important to many, we offer free Wi-Fi in the restaurant. However, we cannot guarantee permanent availability. Mara Sopa Lodge is set in the Oloolaimutia Valley and is only 206 km south of the Equator on the eastern boundary of the Masai Mara Game Reserve. The lodge has 77 rooms, all of which are ‘rondavel’ style and have en-suite bathroom facilities which provide shaving sockets and hairdryers. Every room and suite has a private, elevated verandah with splendid views across the valley. Here guests can relax, sunbathe and watch resident birds and wildlife. Mini-bars are also available in each room. The lodge has direct-dial telephone facilities as well as satellite television and video options. Lodge generators provide 240volts, 50 cycles 24 hours a day. The water supply is from nearby springs but filtered water, provided in flasks in every room, and bottled water is recommended for drinking. 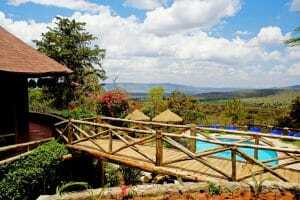 Sopa lodges has a free-form swimming pool in a stunning location, overlooking the Oloolaimutia Valley.